The Signal Box01263 715779work01603 870304fax Self-cateringIf you are looking for a unique, romantic, get-away-from-it-all holiday The Signal Box is a delight. Recently renovated by its owners this charming and individual holiday cottage has everything to hand for a relaxing holiday, including the wine cooler! There are lovely views from the upstairs floor and it would be all too easy to sit and dream the days away whilst holidaying here but let the tranquil setting tempt you out and about for lovely walks and if you have dogs, they can come too. Immerse yourself in the peace and quiet, unwind and forget about the rat race for a while. • Other: Books, games, sofa-bed for flexibile sleeping arrangements, please request on booking. Secure bicycle storage. You may need to pay an Accidental Damage Deposit or Accidental Damage Deposit Waiver for this property. Where applicable we will contact you in good time before your holiday with further details and to take payment. Exterior image of this unique and quirky property! 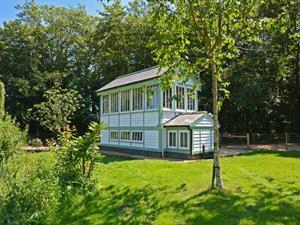 If you are looking for a unique, romantic, get-away-from-it-all holiday The Signal Box is a delight. Recently renovated by its owners this charming and individual holiday cottage has everything to hand for a relaxing holiday, including the wine cooler! There are lovely views from the upstairs floor and it would be all too easy to sit and dream the days away whilst holidaying here but let the tranquil setting tempt you out and about for lovely walks and if you have dogs, they can come too. Immerse yourself in the peace and quiet, unwind and forget about the rat race for a while. The grid shows the prices and weekly availability for each unit. It's easy to check availability for particular dates, just use the Calendar to choose the start date, select the number of weeks and click the Search button. Click the Book button to book the highlighted days.